Beck will hit the road for a handful of tour dates this summer that will include performances of new songs from an upcoming acoustic album. The singer will perform what he's calling a "special acoustic set" July 2nd at the Days Off Festival in Paris, July 27th at an Americanarama date with Bob Dylan and Wilco in Wantagh, New York, and July 28th at the Newport Folk Festival in Rhode Island. He will also perform full-band electric shows August 2nd in Boston and August 4th in Brooklyn. 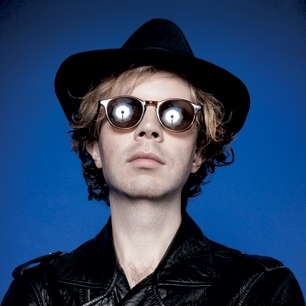 Beck's forthcoming acoustic album "can best be described as a self-contained work, one that came in the form of a burst of inspiration," according to a release, following last year's Song Reader, an "album" consisting solely of sheet music that Beck published in collaboration with McSweeney's. Shortly before Song Reader came out, Beck said that he had been revisiting a record he began working on in 2008. "I'm trying to carve out some time from all the production work that I'm doing to finish those songs before they become relics from a lost era," Beck said last November. "It's going on a half decade old at this point." There's no word on a title or release date for the new album.